The twin-engine truck came into use before World War II as a means of hauling heavy loads when the engines of the day could not get the job done. Only one or two of the heavy-duty diesel engines at the time were more powerful than the standard truck gas engines, but they were expensive and still being developed. The Grico Twin-Motor Truck, a Ford modified to use two flathead V-8 engines was one of the several pre-war trucks of this type. During the war, both the Thornton Axle Company and E & L Transport were also involved in building twin-engine trucks. 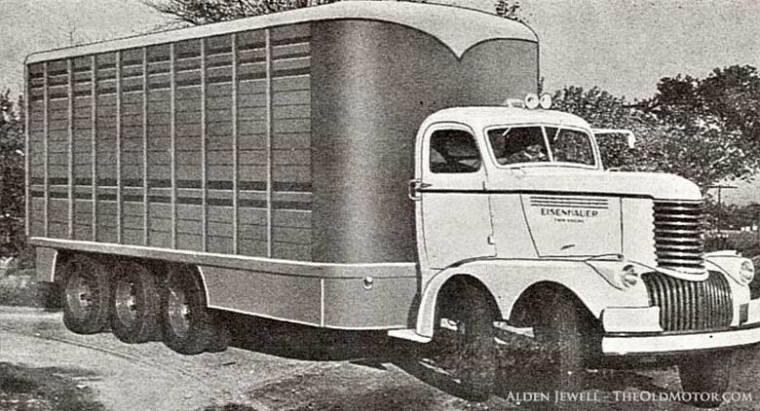 Just after the war in 1946, the Eisenhauer Manufacturing Co. built a twin-engine Chevrolet truck that incorporated five axles, with the forward pair of axles along with the fifth unit handling the steering duties. By viewing both the plan and side view drawings (below), the two independent drivetrains the truck used, each including separate driveshafts, and rear drive-axles can be seen. The Eisenhauer brochure praised the design for providing: two 235-c.i. engines that could be used singly or as a pair when needed, greater front end payload capacity, multiple axles for a smooth ride, stability and load carrying, one of the final benefits claimed for the design was that jackknifing was not a possibility. According to historian Alden Jewell who provided the photos: Only one of these revolutionary trucks was built, despite the touched-up pictures showing other bodies. 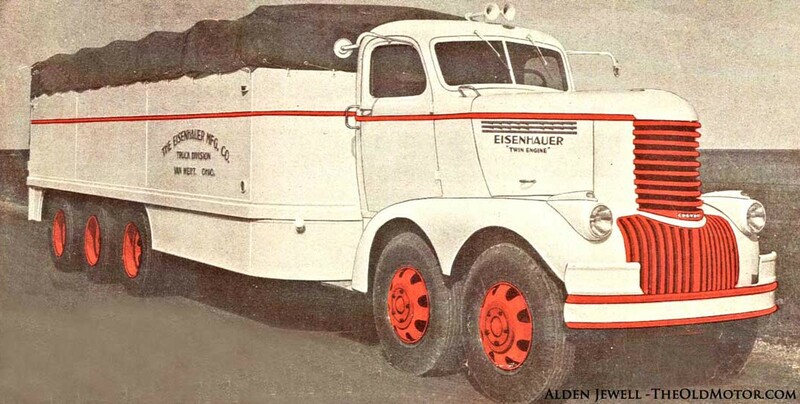 Alden has also found that: Five prototypes were later built for a second generation Eisenhauer Truck, dubbed the X-2 with financial help from Ed Fisher of Fisher Body Co. fame. Side-view of the Eisenhauer twin-engine five axle truck. Touched-up photo showing a van body. Plan-view of the Eisenhauer twin-engine five axle truck. Touched-up photo showing a tanker body. This entry was posted in Out Of The Box, Trucks, Buses and Equipment and tagged E & L Transport twin-engine trucks, Eisenhauer Freighter, Eisenhauer Manufacturing Co., Eisenhauer Truck X-2, Fisher Body Co., Grico Twin-Motor Truck, Thornton Axle Company twin-engine truck. John, we thought the same thing about all the time and thought that went into this creation. I wonder what the rear drive axle would do steering wise when backing on rough terrain–unless there was means to lock it. On a similar note, if you keep clicking on the right margin of the Eisenhower brochure, you will come to a Jeep (CJ2?) with two front axles, one at each end. Apparently worked by a double ended pittman arm, would it be worse handling at highway speed than a stock Jeep? Could it be worse? Keep digging–you are doing a great job! Herb, Take another look, right on the drawing you can see an air-actuated lock for backing up. Thanks for the thumbs up. One wonders how the clutching and shifting was handled ( simultaneously?) for the two transmissions shown. It would be interesting to see how that was handled. Eisenhauer claimed that jackknifing was “not a possibility.” This is a straight truck, they don’t under any circumstances, only semi’s do. I read once that out West, pre-WWII, truckers buying Fords were switching out the V-8’s originally installed for Lincoln Zephyr V-12’s bought new from Lincoln dealers until Lincoln higher-ups put a stop to it – warranty issues probably. The Lincoln engine wasn’t all that good anyway, it wasn’t very robust and overheating in the rear of the engine block was a pervasive problem. Cool article, but Hall-Scott were building gasoline powered 1080-cid inline sixes that were comonly installed in highway trucks of the era. A variety of other manufacturers –Buda, Waukesha, International to name a few– also offered massive gas-power for post-war trucks and busses. It’s my understanding that these larger motors were more common out west, were grades are far greater, as well as in logging, mining, oil-field, heavy-haul and such specialized endeavors. Either way, one engine or two, they must’ve sounded like airplanes! Yes, we are aware of the Hall-Scott units, but they were thirsty and expensive. Many of the dual engine trucks that were built to use high production and inexpensive engines that were also easy to obtain and service or replace quickly. This idea has been tried up into the early 1950’s….always was better to use a single engine.., the Hall Scott would have been a good engine, the 1080 would run over a 335 Cummings….the flat head fords weren’t much, as the chevy 6…30,000 miles and they were wore out..